Today marks the fifth anniversary of the Silver Lining Foundation (SLF). It’s hard for any of us to imagine that five years later we would be sitting here on this milestone that is our fifth year anniversary. 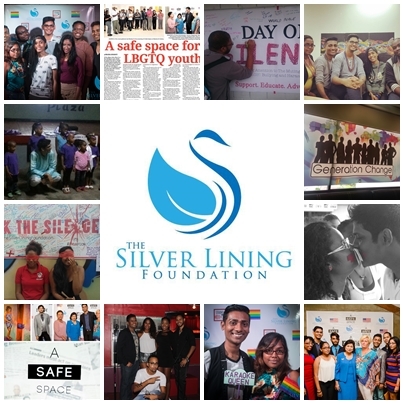 But deeply motivated by a burning desire to seek social justice and impact change in the lives of kids who continue to be bullied by their peers on the sole basis off their sexuality, and a society that struggles to welcome diversity and promote tolerance, the Silver Lining Foundation was launched in an effort to shed a light on the cloud of darkness that often surrounds these alleged taboo issues. Our inspiration was founded under largely tragic circumstances surrounding the untimely passing of our beloved George Kazanjian, who in 2011 tragically ended his life at the hands of his bullies who marked his short existence in this life by constant homophobic taunts, harassment and teasing. Even though it’s been six years later since this tragedy we are still left wondering what George’s thoughts were in those final moments. We would never know how alone and desperate he must have felt to take the decision he ultimately took. But what remains a constant driving force for us, at SLF, is the will and need to ensure that no other child is left to face the harassment and abuse George obviously suffered in painful silence. Over the years we have successfully brought an increased awareness to the issue of bullying specifically targeted to LGBTQIA children. From our “Generation Change” campaign and the introduction of a “safe space” for LGBTQIA students at the University of the West Indies and to our never ending quest in lobbying our legislators and policy makers to end discrimination and include diversity and equality, not just in our nation’s schools, but in our wider society. While our quest has often times painted us, in parts both measured, as the bully, bystander and perpetrator, by supporters and opponents over accusations against our deafening silence and the boisterous noise our advocacy creates, we remain conscientious on small triumphs, hopeful change and renewed energy from unlikely sources. We were inspired beyond measure by the strong conviction and courage it took for a straight male student at a prominent Secondary School in South Trinidad a year ago to find the courage to stand up against the homophobic rant of his teacher, his peers and a system built on heteronormative patriarchal dominance, all in strong and defiant defense of his gay classmate. More recently, we were heartened by the news of the first ever LGBT club for students at the University of the West Indies, initiated by some brave and inspiring youths who are motivated by the premise to champion equality and effect change. We applaud the courageous steps of these students as it reminds us of when we put power in the hands of young people they can change the world in ways, both big and small. So what does the future beckons for the Silver Lining Foundation over the coming years? It is with immense pride and distinguished honor that we get to inform you of our recent successful application in accessing funds through the European Union that will allow us to continue the work we are doing around issues associated with gender, identity and sexuality currently impacted by our nation’s youths. Through this funding we are promising to increase the awareness, strengthen the advocacy and build additional support structures with the introduction of a safe space sessions for parents and families of LGBTQIA children, a series of Teacher Training workshops that trains educators how to directly address gender and sexuality issues in the context of the classroom and finally, we will once more embark on a follow up to our soon-to-be publicized findings from our survey which details a comprehensive look at the state of bullying in our nation’s secondary schools. While we anxiously await to roll out each of these initiatives we are reminded that our successes aren’t measured by the amount of accolades we receive, the recognition garnered or fame attained but by the lives we have touched and impacted through the causes we have stood up for. This therefore brings us to every kid whose identity and sexuality remains a source of struggle and conflict – and to every kid who has ever been called a name that makes them feel less than who they are or what they can achieve, – and to every kid who has ever received a blow or hit or shove that threatens their personal safety and security – we speak directly to you when we say, know that your worth isn’t measured by how many times the bullies try to knock you down but by how many times you stand up proudly staying true to your unique self as you defy their verbal rants and physical attacks. Know that we at the Silver Lining Foundation feel your pain, hear your cries, and share your struggles. But most importantly, we want you to know that this period of silent suffering does not last, in spite of the odds you think are against you. We encourage you to believe that at the end of every struggle there is a “silver lining” that welcomes change, accepts differences and provides hope for a better and more promising tomorrow. And until that day is finally realized, we at the Silver Lining Foundation continue to support and love you for who you are and who you were born to be. Happy 5th Year Anniversary from all of us at the Silver Lining Foundation.